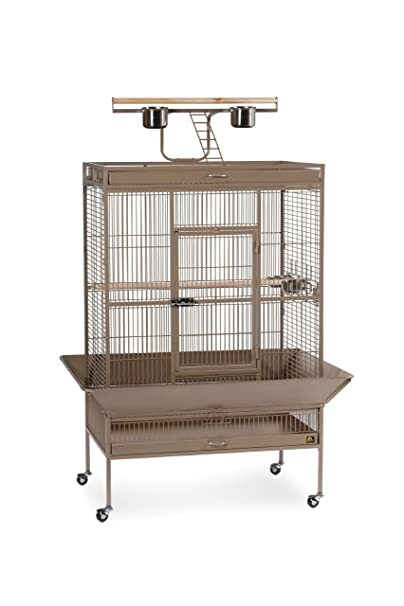 Prevue Pet Products Park Plaza Bird Cage Coco Brown 3352COCO offers quality craftsmanship at an affordable cost. Constructed of durable wrought iron, this cage is designed for parakeets, canaries and other small to medium sized birds. Cage includes one solid wood perch, two stainless steel cups and an easy rolling stand with casters. Pull out grille and debris tray make this cage easy to clean while the rounded corner seed guards and solid-panel cup doors control debris outside the cage. A heavy duty lock plus additional windbell securely fast the large front door. Our Park Plaza 3352COCO cage in Coco Brown measures 24″ long, 20″ wide and 52 3/4″ high with ” wire spacing. Prevue Pet Products Square Roof White & Purple Bird Cage Kit 91210 contains everything you need to keep your bird safe and entertained. 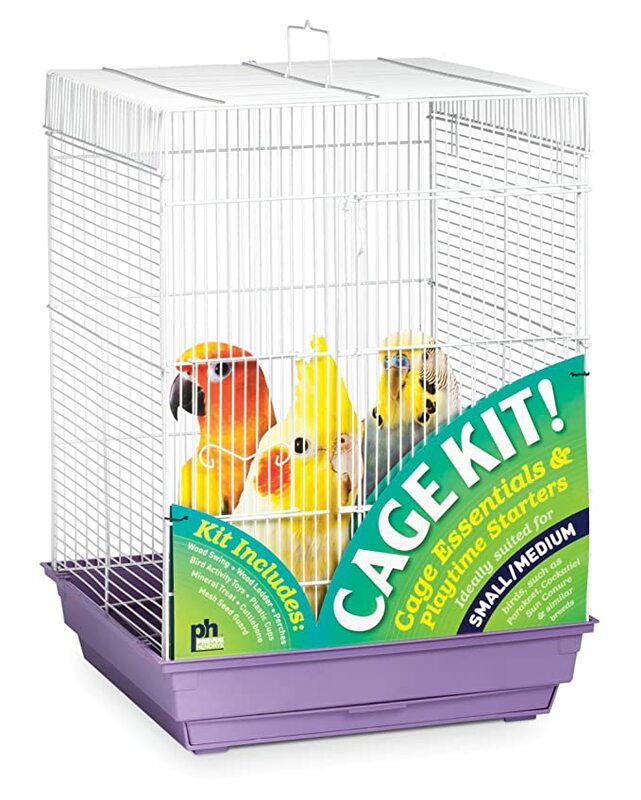 Our Square Roof Cage Kit includes two hooded plastic cups, two plastic perches, one cuttlebone, one solid wood ladder, one mineral treat and a variety of toys. Measures 16-Inch long, 16-Inch wide, 22-Inch high with 5/8-Inch wire spacing, designed for small to medium sized birds. Toys and accessories may vary from picture. Prevue Pet Products wrought iron select cage in coco brown offers quality craftsmanship at an affordable cost. Constructed of wrought iron with a cagetop playstand to keep your bird entertained and content, the heavy-duty push button lock keeps your bird securely inside its cage when playtime is over. This select bird cage also includes four stainless steel cups, two wood perches and a castered stand for portability. Both drawers and bottom grille are removable for ease of cleaning while the rounded corner seed guards control mess around the cage. Our wrought iron select cage in Coco Brown measures 36-inch long, 24-inch wide, 66-inch high with 3/4-inch wire spacing. Prevue Pet Products wrought iron select cage in coco brown offers quality craftsmanship at an affordable cost. Constructed of wrought iron with a cagetop playstand to keep your bird entertained and content, the heavy-duty push button lock keeps your bird securely inside its cage when playtime is over. This select bird cage also includes four stainless steel cups, two wood perches and a castered stand for portability. Both drawers and bottom grille are removable for ease of cleaning while the rounded corner seed guards control mess around the cage. Our wrought iron select cage in Coco Brown measures 30-inch long, 22-inch wide, 63-inch high with 3/4-inch wire spacing. 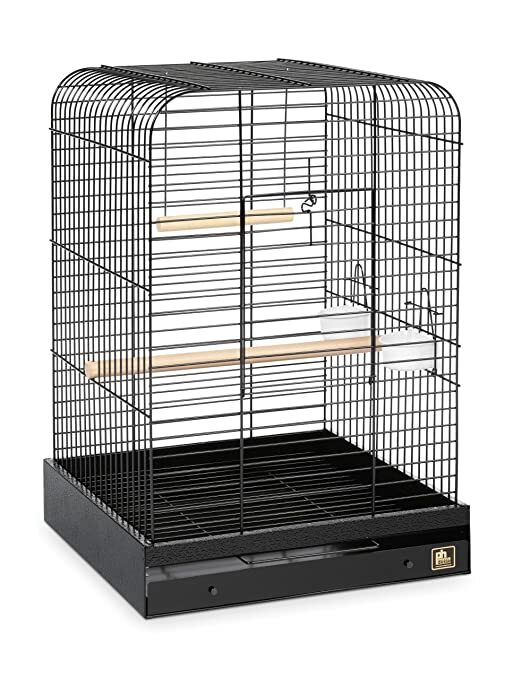 Prevue Pet Products Park Plaza Bird Cage Black Hammertone 3351BLK offers quality craftsmanship at an affordable cost. Constructed of durable wrought iron, this cage is designed for parakeets, canaries and other small to medium sized birds. Cage includes one solid wood perch, two stainless steel cups and an easy rolling stand with casters. Pull out grille and debris tray make this cage easy to clean while the rounded corner seed guards and solid-panel cup doors control debris outside the cage. A heavy duty lock plus additional windbell securely fast the large front door. Our Park Plaza 3351BLK cage in Black Hammertone measures 18″ long, 18″ wide and 49″ high with ” wire spacing. 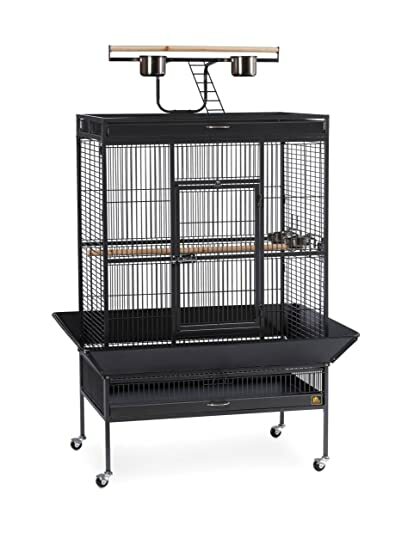 Prevue Pet Products Parrot Cage Black 125BL comes completely assembled with an all-welded, unibody cage construction proudly made in the USA. Perfect for your parrot or other medium to large sized bird, this parrot cage features a large landing-style front door and includes two cups plus one wood perch and one swing. Grille and tray are removable for ease of cleaning and each cage features a durable baked enamel finish. Our 125BL Parrot Cage in Black measures 20 Inch Long, 20 Inch Wide and 29 Inch High with 1 inch wire spacing. Made in the USA. 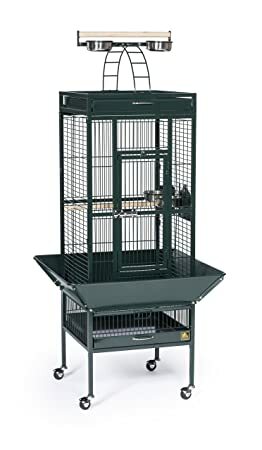 Prevue Pet Products Wrought Iron Select Cage in Jade Green offers quality craftsmanship at an affordable cost. Constructed of wrought iron with a cagetop playstand to keep your bird entertained and content, the heavy-duty push button lock keeps your bird securely inside its cage when playtime is over. This select bird cage also includes four stainless steel cups, two wood perches and a castered stand for portability. Both drawers and bottom grille are removable for ease of cleaning while the rounded corner seed guards control mess around the cage. Our Wrought Iron Select Cage in Jade Green measures 18-inch long, 18-inch wide, 57-inch high with 3/4-inch wire spacing. Prevue Pet creates pet products for owners that have safety and health as their top priority. Prevue Pet ensures nothing but the best in quality material and design for your loved one. Don’t settle for anything less, use Prevue Pet. 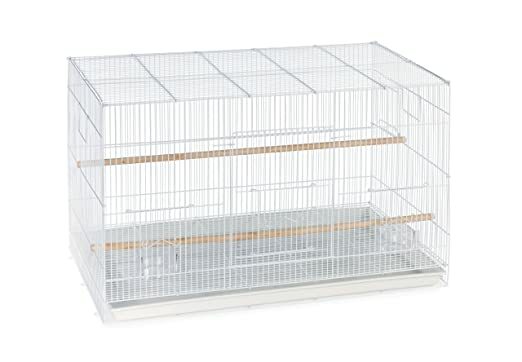 Prevue Pet Products wrought iron select cage in chalk white offers quality craftsmanship at an affordable cost. Constructed of wrought iron with a cagetop playstand to keep your bird entertained and content, the heavy-duty push button lock keeps your bird securely inside its cage when playtime is over. This select bird cage also includes four stainless steel cups, two wood perches and a castered stand for portability. Both drawers and bottom grille are removable for ease of cleaning while the rounded corner seed guards control mess around the cage. Our wrought iron select cage in Chalk White measures 36-inch long, 24-inch wide, 66-inch high with 3/4-inch wire spacing. 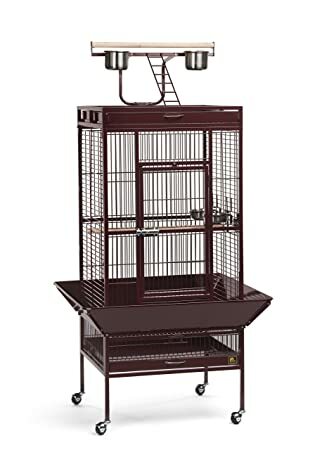 Prevue Pet Products Wrought Iron Select Cage in Garnet Red offers quality craftsmanship at an affordable cost. Constructed of wrought iron with a cagetop playstand to keep your bird entertained and content, the heavy-duty push button lock keeps your bird securely inside its cage when playtime is over. This select bird cage also includes four stainless steel cups, two wood perches and a castered stand for portability. Both drawers and bottom grille are removable for ease of cleaning while the rounded corner seed guards control mess around the cage. Our Wrought Iron Select Cage in Garnet Red measures 24-inch long, 20-inch wide, 60-inch high with 3/4-inch wire spacing. 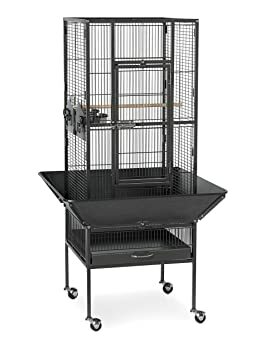 Prevue Pet Products Park Plaza Bird Cage Black Hammertone 3352BLK offers quality craftsmanship at an affordable cost. Constructed of durable wrought iron, this cage is designed for parakeets, canaries and other small to medium sized birds. Cage includes one solid wood perch, two stainless steel cups and an easy rolling stand with casters. Pull out grille and debris tray make this cage easy to clean while the rounded corner seed guards and solid-panel cup doors control debris outside the cage. A heavy duty lock plus additional windbell securely fast the large front door. Our Park Plaza 3352BLK cage in Black Hammertone measures 24″ long, 20″ wide and 52 3/4″ high with ” wire spacing. Prevue Pet Products wrought iron select cage in black hammertone offers quality craftsmanship at an affordable cost. Constructed of wrought iron with a cagetop playstand to keep your bird entertained and content, the heavy-duty push button lock keeps your bird securely inside its cage when playtime is over. This select bird cage also includes four stainless steel cups, two wood perches and a castered stand for portability. Both drawers and bottom grille are removable for ease of cleaning while the rounded corner seed guards control mess around the cage. Our wrought iron select cage in black hammertone measures 36-inch long, 24-inch wide, 66-inch high with 3/4-inch wire spacing. Prevue Pet Products Park Plaza Bird Cage Coco Brown 3351COCO offers quality craftsmanship at an affordable cost. Constructed of durable wrought iron, this cage is designed for parakeets, canaries and other small to medium sized birds. Cage includes one solid wood perch, two stainless steel cups and an easy rolling stand with casters. Pull out grille and debris tray make this cage easy to clean while the rounded corner seed guards and solid-panel cup doors control debris outside the cage. A heavy duty lock plus additional windbell securely fast the large front door. 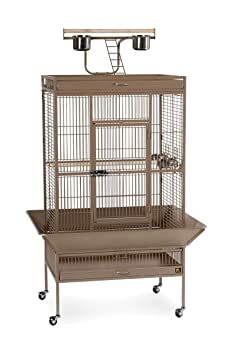 Our Park Plaza 3351COCO cage in Coco Brown measures 18″ long, 18″ wide and 49″ high with ” wire spacing. 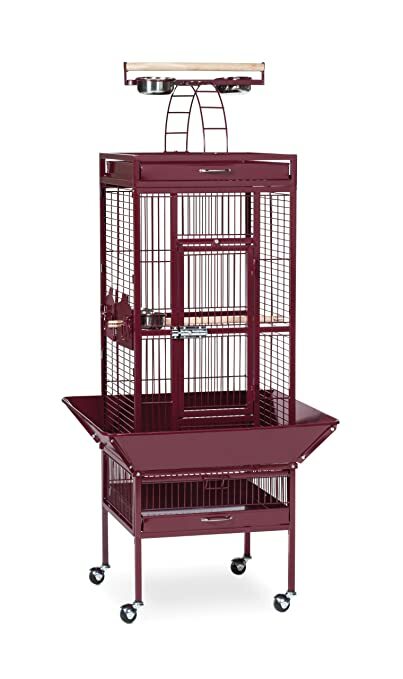 Prevue Pet Products Wrought Iron Select Cage in Garnet Red offers quality craftsmanship at an affordable cost. Constructed of wrought iron with a cagetop playstand to keep your bird entertained and content, the heavy-duty push button lock keeps your bird securely inside its cage when playtime is over. This select bird cage also includes four stainless steel cups, two wood perches and a castered stand for portability. Both drawers and bottom grille are removable for ease of cleaning while the rounded corner seed guards control mess around the cage. Our Wrought Iron Select Cage in Garnet Red measures 18-inch long, 18-inch wide, 57-inch high with 3/4-inch wire spacing. 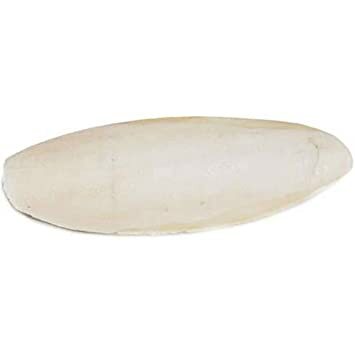 Prevue Pet Products Flight Cage in White SPF0610 is a great way to encourage exercise for your parakeet, finch or other small bird. Included feeder cups and perches are designed to ensure the cage interior remains spacious and attractive. A large, front opening door and removable plastic tray allows for quick and easy cleaning. Compact footprint lets you easily stack additional flight cages. Available in White only,Prevue Pet ProductsSPF0610 Flight Cage measures 30-inch L, 18-inch W and 18-inch H with 3/8-inch wire spacing.